Since the settings are set up correctly, we can now create and run the APT Process. Simply LEFT CLICK the New Process button at the bottom of the New Process window or, if Revoice Pro is the selected program, press the N key (shortcut) on the keyboard. 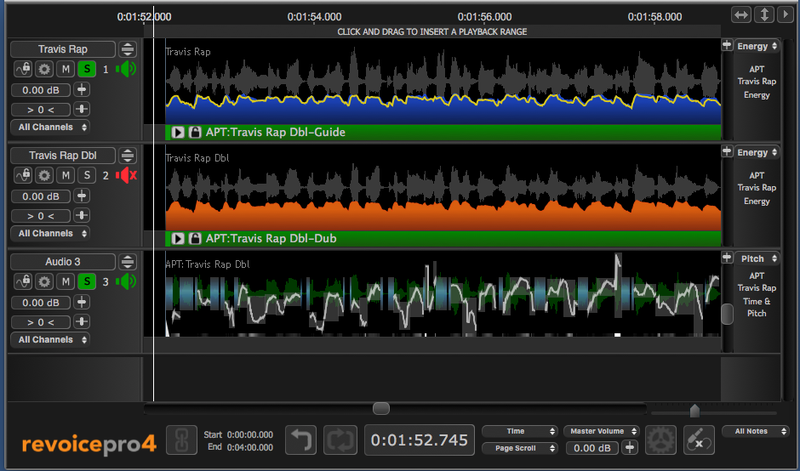 In this example, creating the New Process will insert the green (selected) Guide and Dub Process Control Blocks (shown in the picture below with names APT:Travis Rap Dbl-Guide and APT:Travis Rap Dbl-Dub) into the Process Control Tracks (below each corresponding audio waveform). These Blocks show where the processing will start and end for each input signal. A red line will also appear in the Output track (Audio 3), showing where the output audio of the process is ready to be rendered. However, if background processing is turned on the Energy of the Guide and Dub will be shown in blue and orange in Tracks 1 and 2 respectively, and the output audio will be rendered immediately and appear in Audio 3 (along with the pitch trace). The yellow trace over the blue Guide energy shows how well the time-aligned Dub energy is being matched to the Guide Energy pattern. 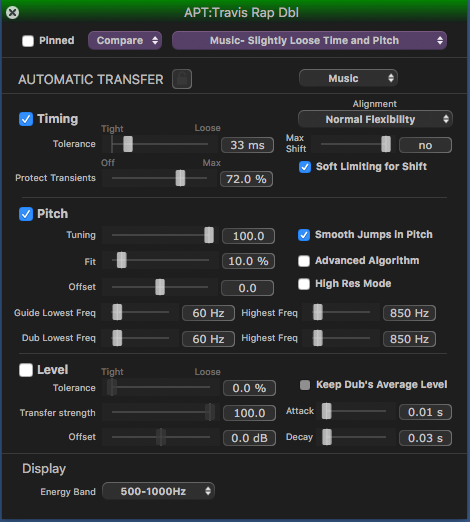 If the input audio, output audio, or range settings do not seem correct, the user can use CMD Z (Mac) or CTRL Z (Windows) to remove the Process, then change the setting, and re-create the process with the corrected settings. To inspect and change the audio processing settings in the APT Process Control Panel, if the APT process Output, Guide or Dub process control track is selected (green), press the P key on the keyboard (or the "open" arrow in the Guide or Dub Process Control Blocks) to open the Control Panel as shown right. Make any required adjustments (Details will be given in Modifying the APT Process controls) and the audio will be reprocessed. Press P again (or the close button) to close the panel.